1943 Overseas in December 1943 (Italy) as a Tail gunner in a B-24 Liberator, until he returned to NY Harbor December 23,1944, then to California and Texas. Received a Purple Hearts when he was shot 3 times on a mission over Bucharest Romania Once in the leg and once in the groin and severely in the head. 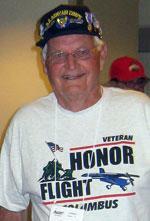 He wouldnt have made it home if his crew members didnt tear their parachutes up to use for bandages. They crash landed in Bari Italy off the coast on June 28th 1944. Shot down two German fighters. Flew 53 missions in the B-24. Check back soon for the full bio. 6/28/1944 B-24 Flak Shak's last stand for ten men over Romania. Over the course of it's mission - and its lead position in the formation - no fewer than eight Luftwaffe fighters would take their turn, spraying cannon and machine gun fire into the bomber, slicing skin of both man and machine. The duel began en route to the target when bombardier John Dempsey took a hit in the leg, splitting the bone. But, as lead plane in the formation, Flak Shak was the que for the others to toggle their payload. Dempsey held himself together through the run to ensure that its job was successfully completed. Having a crippled crewman totally changed the already charged atmosphere within the airplane. Eight German Bf-109s selected Flak Shak for destruction, making pass after pass, firing into the bomber - hot splinters, fist-sized holes appearing like demonic magic in the wing, tail, fuselage - the howl of wind, the roar of engines and the muffled pain of two, three, four, five, six, seven, eight, nine crewmen, clutching from their fresh wounds. 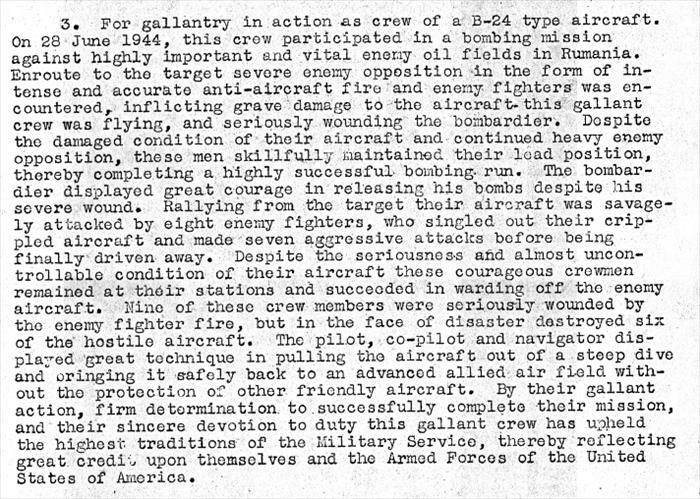 Six of the enemy fighters were shot down. For those who may not be so familiar, the job of a gunner on a flying, bouncing WW2 bomber was especially challenging. Flak Shak's gunners were firing at fast moving targets from a moving position. Like duck hunting from a circling boat. Flak Shak didn't go down. At least out of defeat. The pilot and co-pilot brought the maimed bomber to a short strip, forward airfield in Bari, Italy where it skidded to a dusty halt. Over 500 holes were counted but the decision was moot - Flak Shak would never fly again. Yet, every crewman survived the mission. 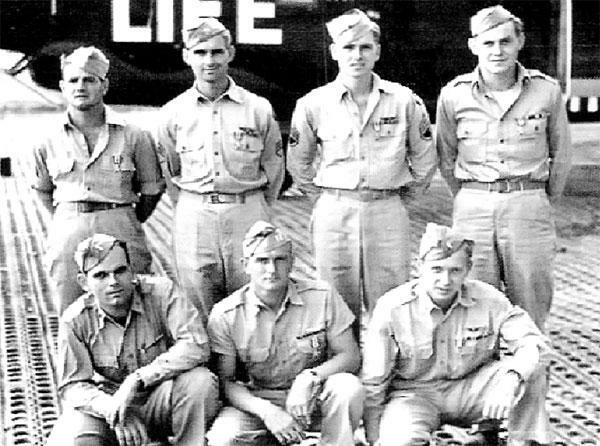 Flak Shak B-24 Crew members. Top Left: Ed Hartupee, ballgunner; Virgil Anderson, top gunner; Francis Brittain Jr. nosegunner; Robert Hickman, tailgunner. Bottom Left: Kenneth Leasure, navigator; Volney Wiggins, pilot; Matthew Hall, copilot. 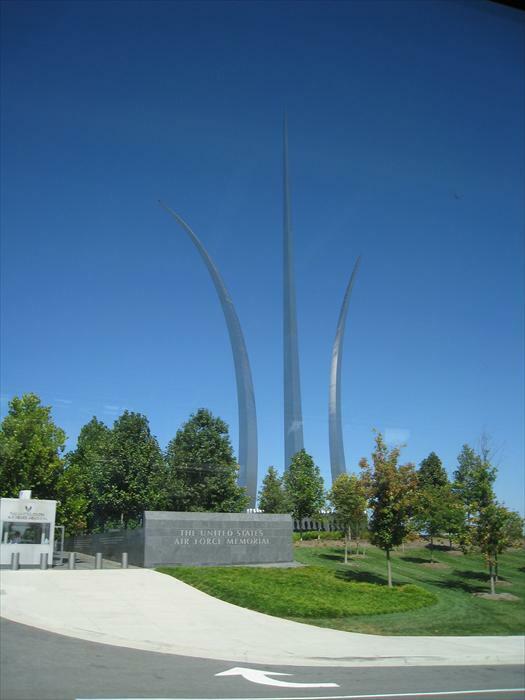 Missing due to wounds were John P. Dempsey, bombardier; Martin J. Caine, radio operator; Wilson B. Shimer, engineer. Hickman's silver star letter for his heroic flight in Flak Shak over Romania. 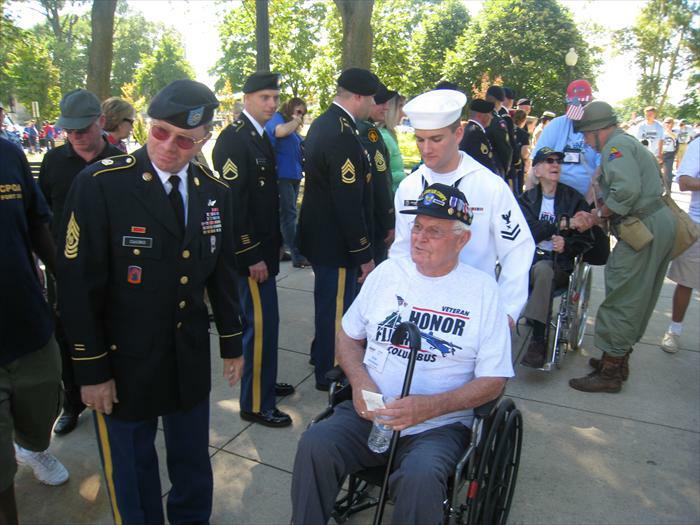 Honor Flight makes a special stop passing by The United States Air Force Memorial in Washington, D.C.
WW II Veteran Bob Hickman gets a hero's welcome and military + civilian greeting line as he enters the World War II Memorial in Washington, D.C. 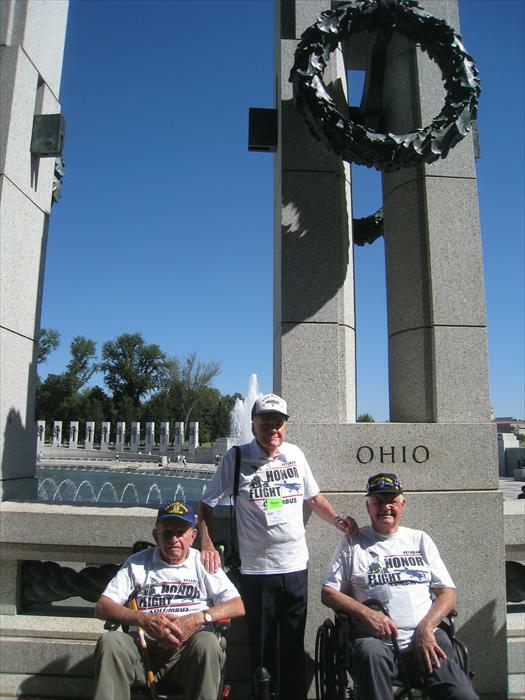 Honor Flight Distinguished WW II Veterans Bob Hickman, Bob Lamp and Bill Taylor pause at their Ohio pillar of the World War II Memorial honoring the service from each of the 50 states and US territories. 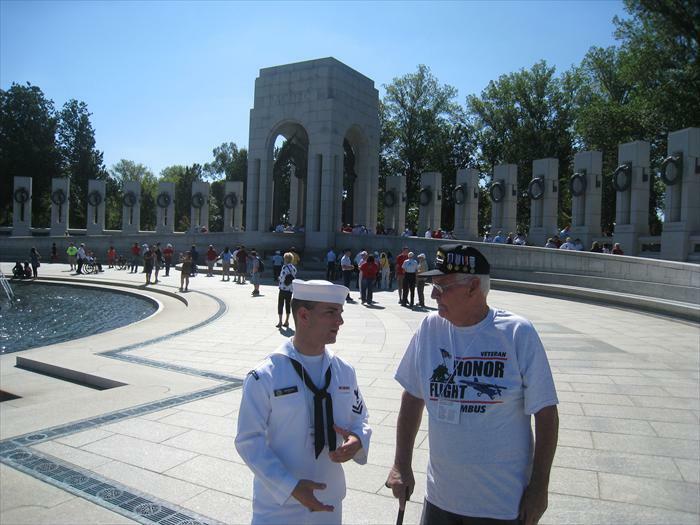 WW II Air Force Hero Bob Hickman shares some of his stories and memories with a young Merchant Marine while walking around the World War II Memorial. 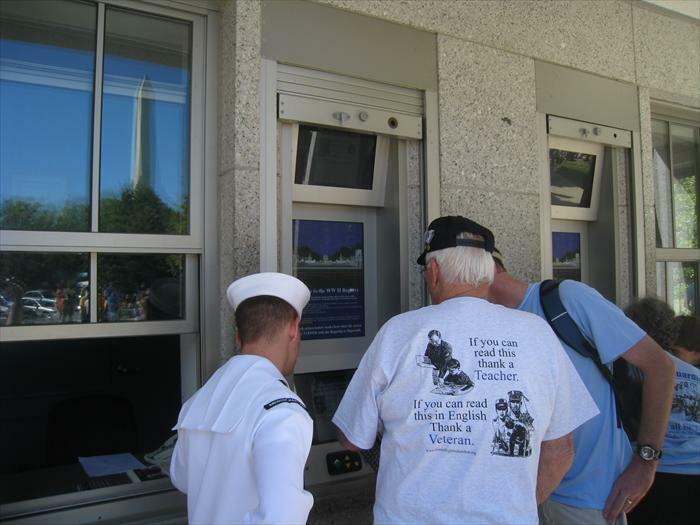 WW II Hero Bob Hickman checks out his own special biography page and photo at the World War II Memorial's Veteran Database on the grounds of the memorial.